Place the rice in a pot, fill with very hot water from the tap and leave for 1/2 hour. Drain the rice and allow to dry for 15 minutes.Heat the oil in a heavy pot or dutch oven over medium heat and add the rice. Cook the rice, stirring constantly, until it is golden brown. Avoid burning. While the rice is cooking, place the tomato, onion and two cloves garlic in a blender and blend until smooth.Turn up the heat under the rice to medium high and add the tomato mixture. Cook the rice and tomato mixture, stirring constantly until nearly all the moisture has evaporated and it just begins to stick to the bottom of the pot. Now, combine the water and salt and add to the rice. Add and stir in all the optional ingredients uses except the peas. Bring the water to a boil, then turn the heat down until it just simmers. This is the last time you should disturb the rice until it is cooked. Continue cooking, uncovered, until all the liquid has evaporated.When the rice is done, stir it and add the peas. Cover and cook an additional five minutes on the lowest possible heat. Remove the pot from the heat and allow to stand, covered, for ten minutes before serving. Arroz a la Mexicana. I'm happy I tried this. 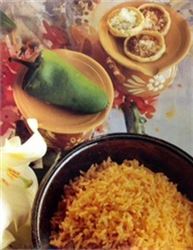 I've been searching for a flavourful Mexican rice recipe and this one definitely was. I will be using this regularly. Thanks for sharing it.